This two day climb is 55 miles (90 km) north of Quito, near the village of Otavalo. 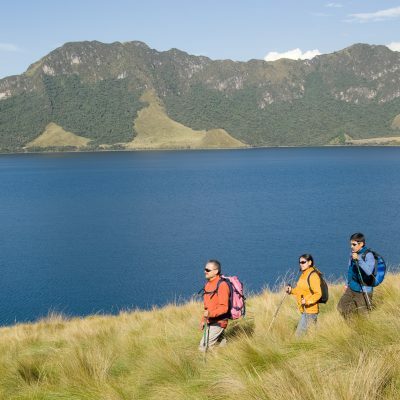 We begin this acclimatization hike at Lake Caricocha, from here we will ascend to the top of the extinct volcano Fuya Fuya. It is a non-technical, but steep hike. At 13,986 ft (4,263 m), Fuya Fuya is the highest point around the lakes and the views from the top are stunning. On a clear day, we may also see the snow-capped peak of Cayambe; the craters of Cotacachi and Imbabura; and the cities of Quito and Otavalo in the distance. The three Mojanda Lakes are at an altitude of approximately 12, 800 ft (3,500 m), and are surrounded by high rolling hills of páramo, a tall yellow grass. The largest of the three is Lake Caricocha, also called Laguna Grande de Mojanda. Its waters fill a huge blown-out caldera that measures almost 2 miles (3.2 km) in width. Just beyond Lake Caricocha Lake are Lake Huarmicocha and Lake Yanacocha. 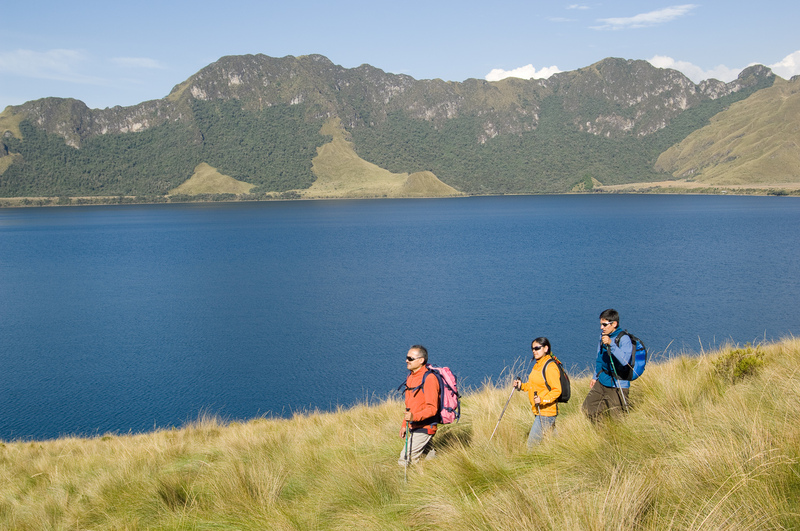 Lake Yanacocha is Quicha for Black Lake, named after its mysterious black hue. At the top of Fuya Fuya we will have a magnificent view of both Caricocha and Yanacocha Lakes. The second day we will visit the Archeological Park of Cochasquì, the site of the most elaborate Ecuadorian pre-Inca mounds. There are 15 truncated pyramids (tolas) with long ramps built from volcanic ash blocks. They are surrounded by 21 funerary mounds. The site was built by the Indians of the Cara or Cayambi-Caranqui nation, and many archeologists believe that prior to the Inca conquest this site served as the ceremonial center of their large cultural area (extending from Quito to north of Ibarra). Since their construction thousands of years ago, these pyramids have slowly been covered by earth and grasses. A few pyramids have been excavated giving visitors a good idea of their construction, which is estimated to have occurred between 950 and 1550 AD. Also located within the park are an archaeological museum, two ethnographical museums, an ethno-botanic garden and a museum with musical instruments and games. We leave Quito early in the morning and drive 3 hours to the Mojanda lakes. Here we will climb for 3 hours to the summit of Fuya Fuya. After enjoying the views and a quick lunch, we will hike 2 hours back down to Caricocha Lake. Back at the lake, we will relax for the night at our camp. We will hike down the valley through the open páramo to the Archeological Park of Cochasqui, a 5-6 hour hike. Here we will explore the pre-Incan pyramids and museums of Cochasquì. Then drive back to Quito. see enough? ready to sign up?